A single tooth missing can have a huge impact on your oral health. Even if the problem concerns only one tooth, there are multiple problems that you will immediately experience. Depending on the location of the missing tooth, your whole smile can look incomplete and unhealthy. You can also experience difficulties in chewing or biting on food, and your speech may also be affected when you lose one tooth. How can you make your smile complete again? The form and function of one missing tooth can effectively be replaced with a dental implant. A dental implant replaces the form and function of a missing tooth, and its corresponding tooth root. 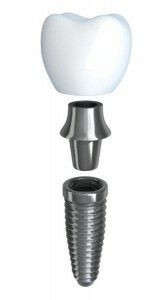 The dental implant is embedded into your jawbone; this titanium screw will be connected to a dental crown which acts as the replacement for the tooth that you lost. This dental implant treatment closes the gap caused by the missing tooth – and makes your smile complete once more! The dental implant makes it possible for you to once again enjoy a healthy, and natural-looking smile even if you have lost a natural tooth. That unsightly space caused by the loss of a single tooth is successfully solved with a dental implant treatment, providing you with the confidence to once again flash the widest smiles possible.